The SESAM security West Plaza configuration demonstrates a single site installation. 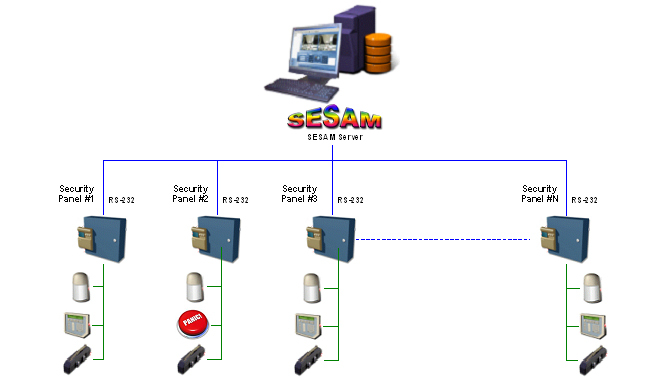 Various combinations of security panels can be connected to the same SESAM computer, via RS-232, to allow connecting more security panels; TCP/IP to RS-232 converters may be used. Thus, the number of detectors that can be connected to the system is unlimited, depending on the security panel’s capabilities. SESAM computer is located in the control center and the security panels are distributed over the site. The system operator can sit in front of the computer, view the events, and handle them accordingly. ARMED / DISARMED / BYPASS actions can be performed from the computer, depending on the security panel model and whether it allows bi-directional access.